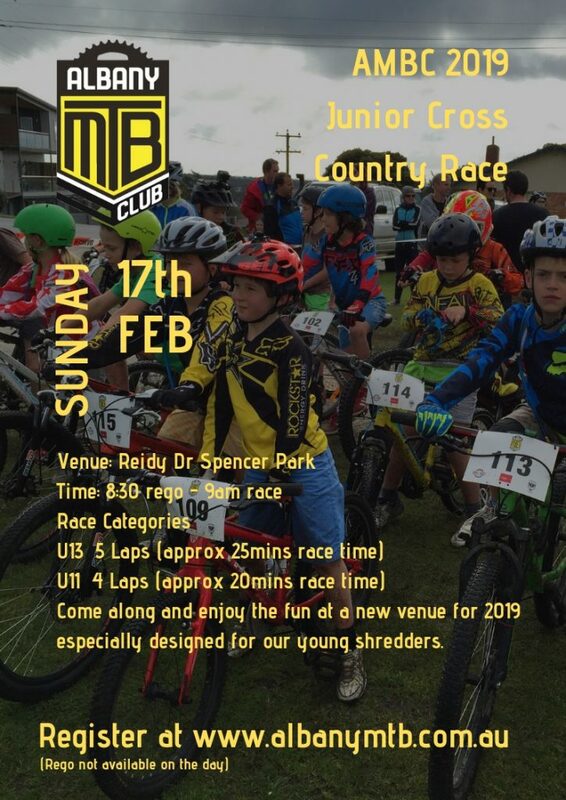 Welcome to Albany Mountain Bike Club’s 2019 Junior Season Opener ! We are trialling a new format this year, with our Under 13s and Under 11s junior races run separately from the seniors, to allow a more beginner-friendly course for our younger riders. This round will be held near Reidy Drive in Spencer Park, on a relatively flat track designed to accommodate our newer and less confident riders. There will be no scary jumps or steep hills, so everyone can enjoy the thrill of competetive MTB racing ! Please ensure you register before the day, as there will be NO on the day registrations. Australian standards helmets are MANDATORY, and their bike must be in safe working order with at least ONE brake. Once they are hooked (and they will be !) yearly membership for ‘Dirtmasters’ (Under 12) is only $52, which provides cover for racing and recreational riding, along with many other member benefits. Please see the club Facebook page for more discussion, or to contact us with any questions you might have.